We hope you come to love Juice Plus+ as much as we do. It's reassuring to know that we're putting 17 fruits, vegetables and grains into our bodies every single day, lowering our risk of disease, and improving our day-to-day health and vitality. As parents, we have our work cut out for us. Its hard enough to get kids to eat healthy foods like fruits and vegetables when their taste buds are hardwired to prefer donuts, french fries, and pizza. Yet even if were lucky enough to have kids who dont reject every green thing served to them, many of us find we simply dont have the time to prepare healthy, nutritious foods every single day. 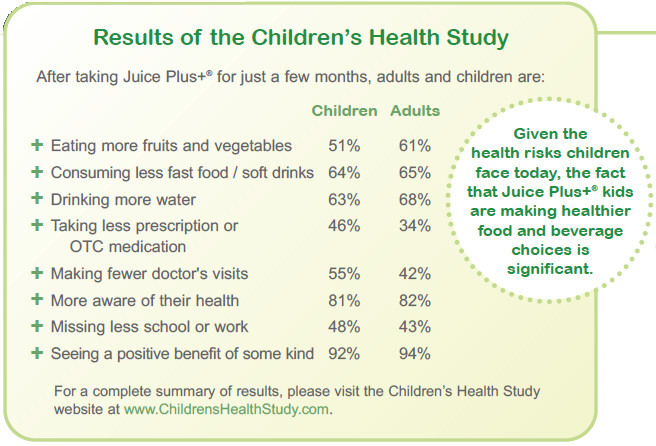 Thats why so many hundreds of thousands of moms, dads, and kids have come to rely on Juice Plus+ and the Children's Health Study to 'bridge the gap'. It is very important to take Juice Plus+ consistently, every day for at least 4 months. It takes 90-120 days for blood cells to be replaced with new, healthier cells. Many people notice results within a few weeks, some even after a few days. Most people, however, experience benefits after 3-4 months and even more improvements after a year or two. How these show up in results you can see or feel will be unique to you, but we would expect you to see most of these and more. In the coming months you will be receiving several emails from Juice Plus+ Doctors giving you their insights concerning health and nutrition. One of the most famous of those doctors is Dr. Bill Sears. On his CD/DVD Nine Simple Steps for Healthier Family Diets, he discusses the importance of eating a rainbow of colorful fruits and vegetables, consuming good sources of fat like salmon and avocados, starting your day with a 'brainy breakfast', and adding Juice Plus+ to the family diet. If you have any questions, please don't hesitate to contact us by email, or by phone: 970-328-0353.